We are often busy during weekdays, especially for lunchtime. Still, it is sometimes possible to find 20 to 30 minutes to cook something wholesome. As I was about to get started, Layla asked me to increase the proportions so there would be enough for lunch, dinner and maybe a little bit for leftovers tomorrow. 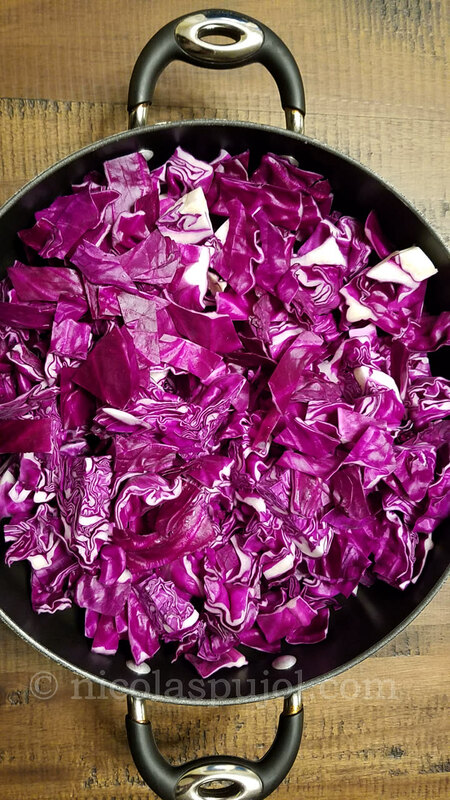 We had a few fresh vegetables in the fridge, so I experimented with the following recipe. Layla doesn’t always validate these experiments from a taste standpoint — perhaps too much focus on nutrition and fitness on my part. 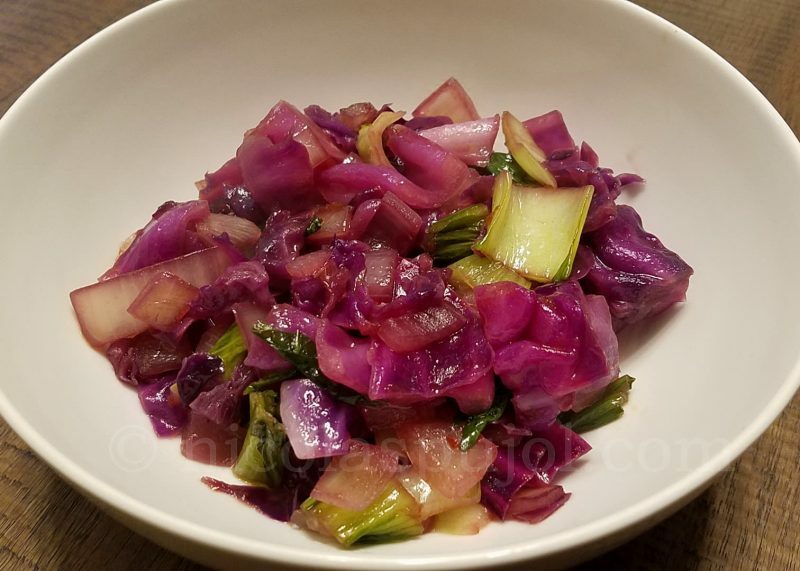 But after she tasted this red cabbage, bok choy stir fry in avocado oil a few hours after I made it, as she was starting to cook dinner, she said it tasted really good. After 18 years of marriage, sometimes I cook things and she likes them less than I think she will. Other times, she likes them more than I think she will. Life is very strange. 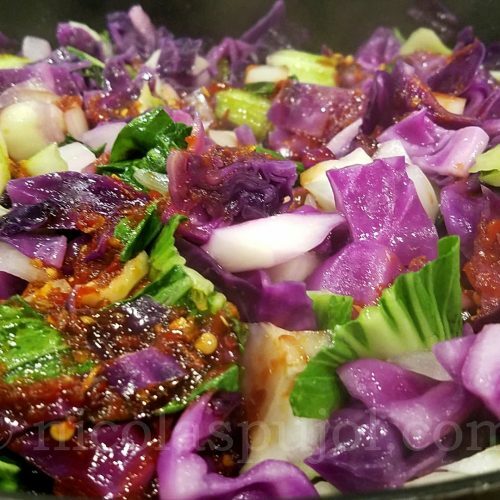 This recipe had Asian flavors: the baby bok choy, sesame oil, the chili paste which is actually a sauce made in Asia, and of course soy sauce. It can be served on its own as a vegan lunch, which is the way I ate it once it was ready. For dinner, we reheated it. 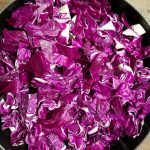 It became a side dish with a seared tuna that Layla made. 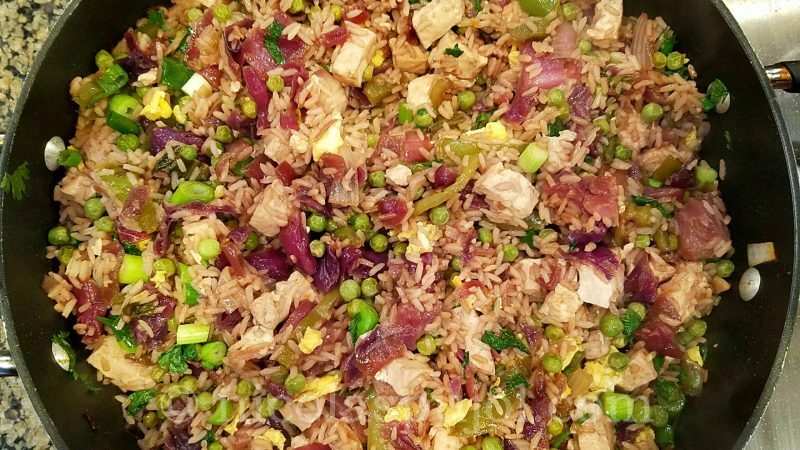 The next day, she used the little bit of leftover that remained and combined it with tuna and white rice into another stir-fry. Here is a photo of Layla’s stir-fry number 2. 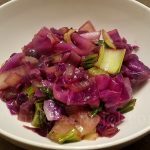 The dish uses quite a bit of oil, but relative to the quantity of vegetable it felt appropriate, tasteful and balanced. Avocado oil tolerates high heat more than sesame, hence why I added the latter halfway through the cooking process. If you want more spice once the dish is made, you can add a few drops of Tabasco. 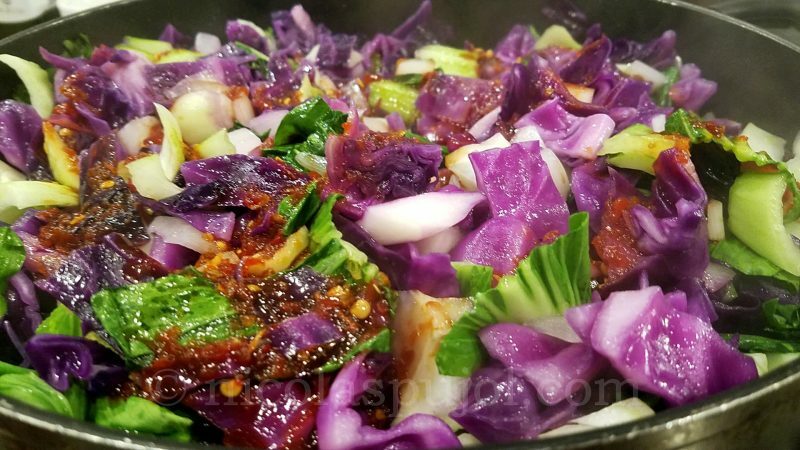 Easy recipe for a tasty red cabbage, bok choy stir fry in avocado oil with yellow onion, sesame oil, light soy sauce and chili paste. 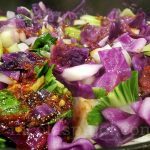 This vegan stir fry can be served as a side dish or main dish. 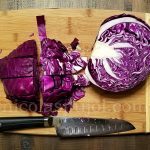 Place the red cabbage into a large frying pan. Add the avocado oil and start on high heat. Cover the top. 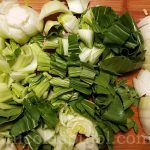 After 5 minutes, add the onion and baby bok choy. 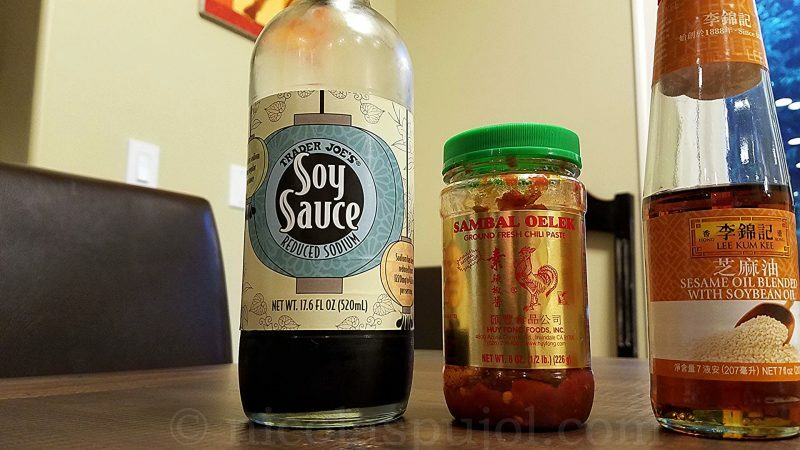 5 minutes later, mix the sesame oil, soy sauce and chili paste together, and ad it to the mix. Stir well, slowly. At this point, you can reduce the heat level to medium. Let it cook for another 5 to 10 minutes until the stir-fry is fully cooked. Serve immediately, it also does very well re-heated as a leftover.